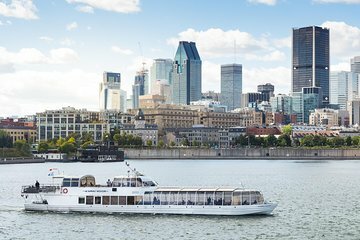 Very good tour, recommended when you visit Montreal. The city speaks for itself and from the river it is really quite beautiful particularly on a lovely sunny day. It's not a tour that wows you, rather it is a pleasant relaxed interlude. My friend and I enjoyed this cruise, but it was because we happened to catch perfect weather. Also, if you really like being on the water, you'll like this tour, too. But there really isn't much to see aside from a few noteworthy buildings and a rollercoaster. Maybe 60 minutes, instead of the 90, would have sufficed. We didn't dine on board, so I can't comment on the food, but the wait staff seemed friendly and efficient. AndI must commend Pascal, the tour guide, for making the very most of the cruise with his lovely voice and interesting tidbits--in both English and French. Also, the boat was clean and the whole process, seamless. My compliments to Viator.